I have the same breakfast almost every morning, but I’ve been mixing it up lately with some tropical fruits and this tasty low-carb homemade museli! It’s so simple, it’s laughable. Nuts and seeds in a bowl, a little cinnamon for flavour and into the oven to toast for eight minutes. It’s surprisingly delicious – I was dubious at first, as I don’t usually enjoy seeds of any sort. 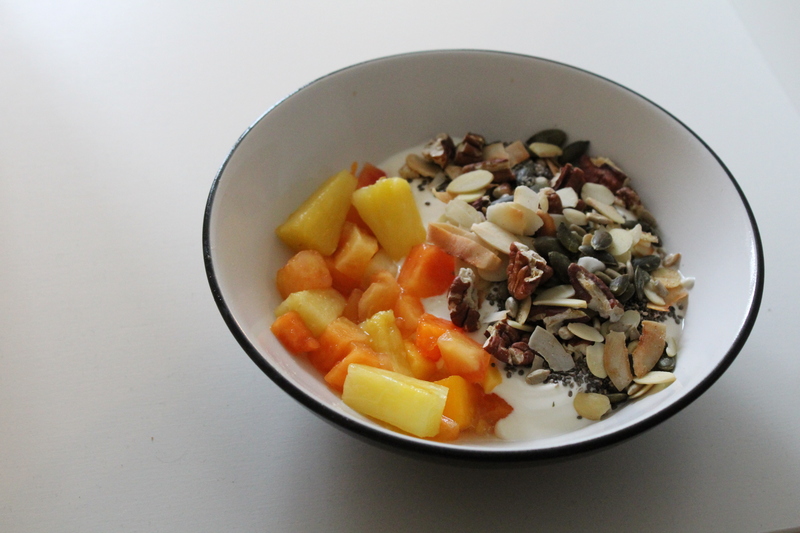 But mixed into some yoghurt with fresh fruit, there’s nothing better! I also added my daily dose of chia seeds, as you can see in the photo. And, it fits in perfectly with my goal of cutting out those pesky carbs! What do you think? Will you give it a try?